There are no robbery charges filed yet, but a man who allegedly crashed a Jeep and ran from police in Lakeview early Friday morning is facing plenty of other problems. Around 3:15 a.m. yesterday, cops tried to pull over a red Jeep that they thought could be connected to a series of recent robberies on the North Side. The driver crashed into two parked cars in the 1100 block of West Roscoe and ran from the scene, police said. 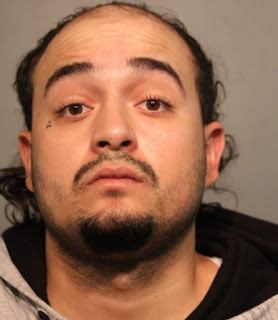 Luis Miguel Rodriguez, a 23-year-old parolee from the Irving Park neighborhood, was taken into custody by cops who found him hiding in a yard in the 3300 block of North Racine. Rodriguez was wanted for questioning in connection with at least one robbery, according to a police source who spoke on condition of anonymity because they are not authorized to discuss department matters with the media. Detectives continue to look into any links he may have with recent hold-ups. Approximate locations of eight robberies in last Monday's police alert. 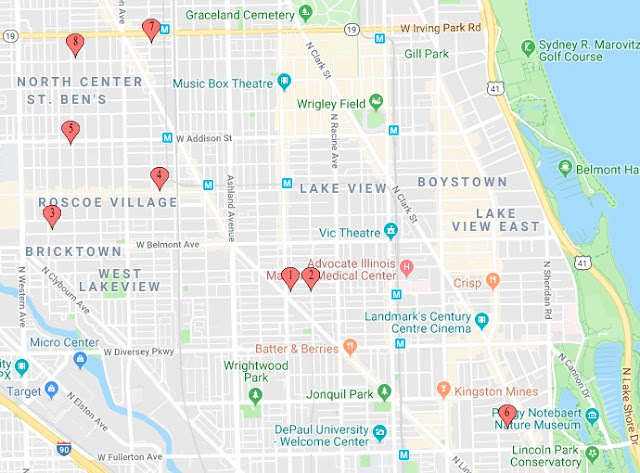 On Monday, police issued a community alert after a series of eight armed robberies across the North Side was connected to a group of offenders. The alert said that the suspects were seen leaving one of the robberies in a dark-colored Jeep. At least one offender had displayed a handgun in his waistband or put a gun to the victim’s head while demanding valuables in each hold-up, police said. The robberies were reported in Lincoln Park, Lakeview, Roscoe Village, and North Center on May 14 and May 17, according to police. State records show that Rodriguez was paroled in January after serving about half of a one-year sentence for narcotics.